We solve problems for the Transport Industry through software development. Our customisable platform optimises safety, compliance and efficient work practices for people in transport across all industries. 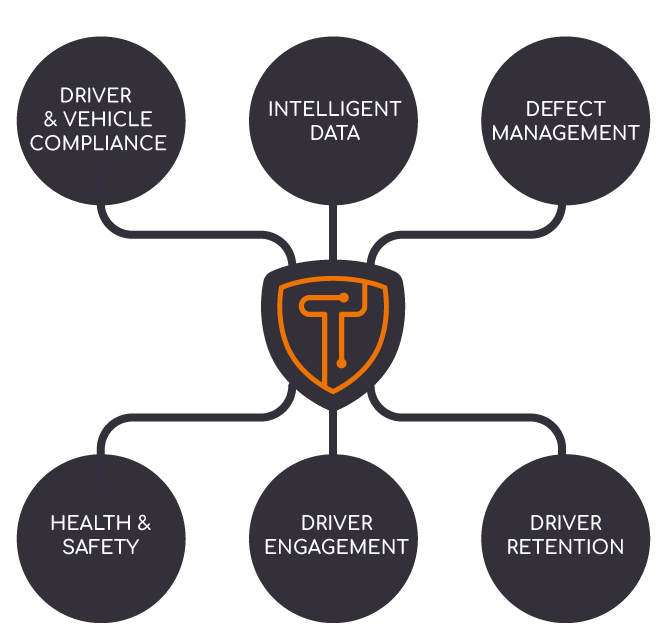 Available worldwide, our solutions empower companies with medium to large fleets to effectively manage their compliance requirements whilst also optimising efficiency, safety, awareness and communications of drivers and their vehicles. They work seamlessly together for optimal results, but can also be used as standalone as required. Manage your vehicle checks more effectively in a mobile app. Real time accident information to reduce claims, disputes and enhance protection. To keep your company compliant and build the blocks for complete earned recognition. Vehicle doctor to manage defects, road worthiness and necessary repairs. Promote dynamic learning and remote worker communications to get the best from your drivers. Avoid revenue leakage by optimising your compliance processes. Create space & budget to activate strategic improvements that make a difference.